Many of us already know How to start a blog and do an effective SEO optimized wordpress install , but rarely does anyone give priority in optimizing their blog posts. This needs as much effort as writing quality content. Your content may be very useful to the but they cant find it , unless it appears in the first few pages of Google , the search engine we all use . Google bots cannot differentiate between good content and average content . Personally i dont like the search demon because it prioritizes content which are rather well optimized based on keywords and page rank giving less or no chance to new blogs. Though it is not the case always , but that remains the essence of Google’s ranking strategies . In this post i will try to go in brief through all the few basic things i do to optimize my posts . Though they are not full proof and still remain a part of my ongoing experiments in writing SEO Optimized blog posts . Having the title text optimized is the largest factors for on-page optimization . Say you write a post title like Make money online with Adsense . The competition for this keyword is very high since it contains the word Make money online but you can optimize this title to be search engine friendly. 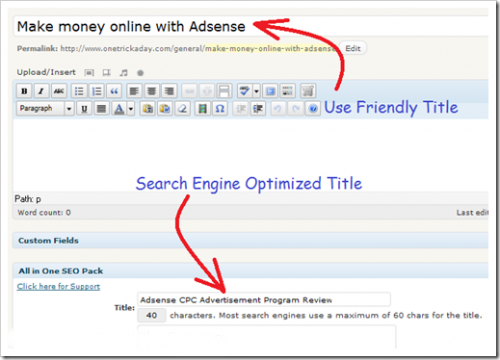 You can make it Adsense CPC Advertisement program review. You may like to keep the User Friendly title in the blog posts and use All in One SEO plugin for wordpress blogs to write the search engine friendly title , the one which Google bot can see when it crawls your site . Use specific keyword to link to your site . Say if your site is about German Cars , any appearance of the keyword should link that to the home page or the page you want to rank high in Google . But only the first link counts . Linking different text to the same page will be of no use . As a blogger centre on using at most two keywords and fit them into the content on a single page. Anything more than that & you run the risk of keyword stuffing & causing a penalty to your blog in search engines . Try to use your main keyword it atleast once or twice in the first 160 characters of the beginning of the post . Quick Tip : Try to write in one target niche , following only a few related keywords . Rank for them and then move on to another . Its like a war strategy , where you secure one post after the other and gradually move on .You cannot take all of them at once , that would be a miserable failure. well written Sourishnath. I liked the war strategy you mentioned and it does make sense perfectly. Something I need to improve ! Nice post. But the main thing is that Content is King. Say you write an article which is very good. Even if 20 people read it, 5 of them will share it. Visitors will increase and more shares and comments will come in. Thanks a lot for giving insights for writing a blog post which is Google Panda friendly. I have shared this article to our editors too. Thanks!